"'We live for The One, we die for The One,' all that. Interesting that you place all your emphasis on the second half of that sentence." 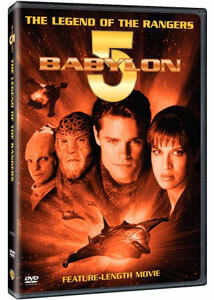 After Babylon 5 ended its five-year run (1993-1998), there followed a series of television movies and an abortive spinoff series, Crusade (1999), which also took place in the B5 universe. A few years later, creator J. Michael Straczynski tried again with this pilot film for another sci-fi series with the same background, set about three years after the end of the main Babylon 5 story line. The Rangers, a teaming of humans and Minbari in a mystical military order, have developed a Spartan-like tradition that no Ranger ever withdraws from battle. When Captain David Martel (Dylan Neal) does so in order to save his crew from a hopeless situation, he faces being drummed out of the Rangers. But G'Kar (Andreas Katsulas) intervenes and suggests that Neal might be the perfect captain for a mission accompanying a diplomatic ship to the archaeological dig on Beta Durani 7. Captain Neal takes along his second in command, Dulann (Alex Zahara), weapons specialist Sarah Cantrell (Myriam Siois), communications specialist Kit Sasaki (Warren Takeuchi) and covert operations expert Malcolm Bridges (Dean Marshall) on what should be a milk run. But things turn deadly when a previously unknown race attacks the diplomatic ship. In some respects, the torch is carried over well from the original series, with the obligatory guest appearance and a few references to the political situation of the parent storyline. The characterizations of the principal characters are solid, though the supporting cast, necessarily, is drawn rather sketchily. The special effects budget doesn't seem to have been quite as good as for the earlier series; the ships at any rate don't feel nearly as convincing. The pilot has some odd characteristics, foremost being an overdose of comic relief, some of it effective but other portions truly cringe-inducing. The pilot already feels dated by its then-trendy reliance on wire fu as the means of directing the weapons systems on the spacecraft. Andreas Katsulas does what he can with some horrifically unwieldy speeches, and Martel is stuck with some improbable expository duties. The script doesn't feel like it had the full attention of Straczynski (who was also thoroughly disrupting the Spider-Man universe about this time); the writing doesn't have his usual sparkle but feels leaden and self-important much of the time. You will truly be sick of "We live for The One, We die for The One" before you're half way through the program. The casting has some issues too; Dylan Neal seems far too young to be a captain, for starters. Alex Zahara seems to be trying to channel Billy Mumy instead of developing his own character. Myriam Sirois seems as if she might have possibilities, but she spends too much time doing the wire fu to really display what she's capable of. The new villains, the Hand, seem altogether too much like the Shadows to feel new and different, though I suppose given time to develop they might have differentiated themselves better. This is a pretty lackluster finale to the B5 universe, so hopefully the planned theatrical movie will become a reality some day. Image Transfer Review: The anamorphic widescreen picture has good texture and detail, as it should for something less than five years old. Color is quite vivid throughout, though the effects work tends to display a distressing amount of aliasing and jagged edges. Audio Transfer Review: The 2.0 surround audio has a nice broad soundstage with plenty of surround information. Range is excellent and there's fine deep bass in the space combat sequences (never mind about the vacuum). Christopher Franke returns to provide the score and it sounds excellent. Extras Review: There are no extras, which may indicate that Straczynski has disowned the project, since he has been quite chatty on all of the other Babylon 5 releases. Chaptering is reasonably thorough. Unsold pilots are not generally your best entertainment value, but fans of Babylon 5 will be interested in seeing a hint of what might have come next.